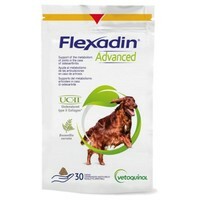 Flexadin Advanced contains UCII, in a truly unique formula that has been designed specifically for dogs to support the metabolism of osteoarthritic joints and cartilage. A novel innovation in joint support, Flexadin Advanced has been produced in a soft palatable chew and contains Omega-3 fatty acids, UCII and Vitamin E.
Flexadin Advanced comes in handy foil zip lock packs which help to keep the chews fresh and tasty. No special loading administration rate is required with Flexadin Advanced and it should be administered as one chew per day, regardless of the dog's weight. Having been recommended by my vet, I decided to try this with my 10 year old Lab, who is beginning to get arthritic and show stiffness in her gait. After 30 days on Flexadin, I have definitely begun to notice a difference. She is walking out more easily and is generally more active showing fewer signs of stiffness. This is only our second month, but so far I am delighted with the results. Time will tell, however , when we get the colder weather how she fares.